Standard courses can now be mapped to an Instance. Previously, all standard courses in SCRIBE were available to all Instances. Standard courses created for a specific Instance would appear for everyone. In addition, SCRIBE now allows users to manage their own standard courses. You can choose to use any of SCRIBE’s built in standard courses or create your own custom standard course only available to your instance. You can access the new standard course management screens from the Tools | Courses | View Standard Courses menu item. The View Standard Courses page will display a table of all standard courses mapped to your instance. You can view details for the selected standard course by clicking the View link. 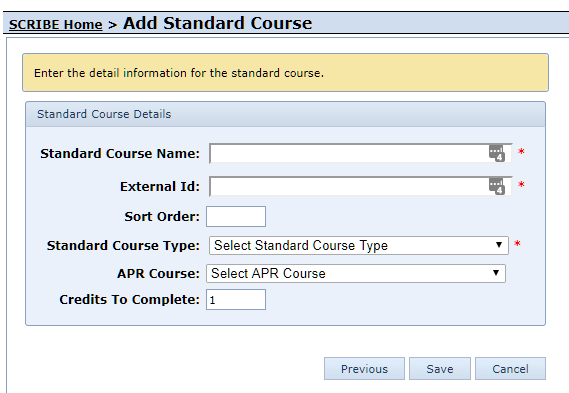 You can filter the standard course table by standard course name, external id, standard course type, and/or the APR course the standard course is mapped to. Users with the proper permissions to add standard courses, can associate an existing SCRIBE system default standard course to their instance or create a new custom standard course. These users will see an Add button on the View Standard Courses page. If there are available SCRIBE system default standard course that can be associated to your instance, you will be prompted to select one of the available SCRIBE system default standard courses or choose to create a new custom standard course. Click Next to continue. If there are no available SCRIBE system default standard courses, you will skip this step and go directly to the create custom standard course step. Standard Course Type (Required) – Type of standard course. APR Course – APR course that this standard course will map to when running APR reports. You can see a list of available APR Courses in the Course/Grades Lookups report. Credits to Complete – Number of credits needed to consider this standard course complete. This is only used if your instance is setup to use the Credits per Term Student Outcome Business Rules. 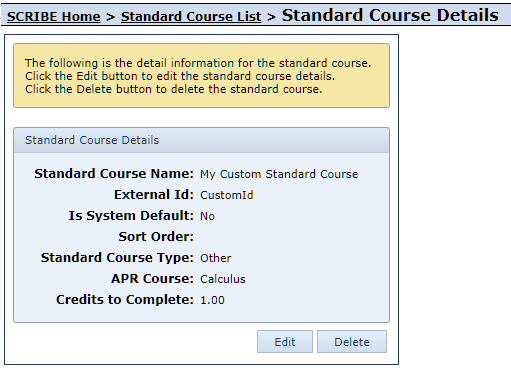 After entering all the information for the standard course, click the Save button. If you are associating an existing system default standard course to your instance, you will only be able to modify the following data elements: External Id, Sort Order, and Credits to Complete. Clicking the view link for a standard course on the View Standard Courses page will take you to the View Standard Course Details page. This will display all the details associated to the selected standard course. If you have the proper permissions to edit standard courses, you will see the Edit button. If the standard course editing is a custom standard course, you will be able to edit all the information for the standard course. 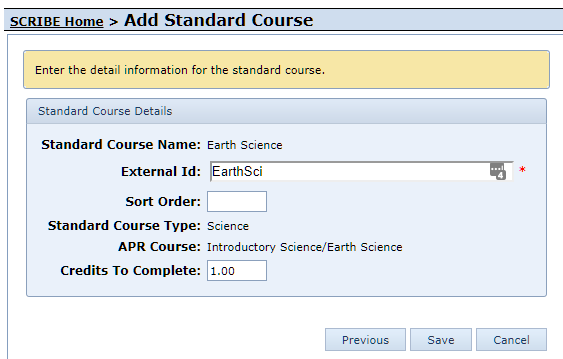 If the standard course editing is a SCRIBE system default standard course, you will only be able to edit the following fields – External Id, Sort Order, and Credits to Complete. If you have the proper permission to delete standard courses, you will see the Delete button. This will either remove the association of a SCRIBE system default standard course from your instance or delete the custom standard course completely. You can only remove standard courses that are not used by any courses in your instance. If you attempt to delete a standard course that is in use by 1 or more course, SCRIBE will alert you. Marking period types can now be mapped to an Instance. Previously, all marking periods in SCRIBE would appear in reports and school year setup screens. This could be confusing as there are sometimes multiple marking period types that are similar in type and name but are not used by the instance. You can see the marking period types mapped to your instance by running the SCRIBE Configuration | Course/Grades Lookups report. If you need to adjust the marking period types mapped to your instance, please contact SCRIBE support. Currently, there are 2 sets of business rules implemented in SCRIBE. The default student outcomes and the split course student outcomes business rules. A new set of business rule have been added – credits per term student outcomes business rules. The default student outcomes business rules is a very basic rules set. The credits associated to the courses is the simply the number of credits the course is worth when course is complete. A course is complete if there is a grade in a marking period/term that is denoted as a final marking period. Only the attendance data in the marking period/term that is denoted as a final marking period is reported on. The split course student outcome business rules is setup to handle “split” courses. Split courses are single courses that are reported as 2 separate courses usually a different course per marking period/term. These split courses causes difficulty in determining if a course is complete since more than 1 course is required to complete a course. For example, an Algebra I course may consist of an Algebra I A course taken in semester 1 and an Algebra I B course taken in semester 2. First, SCRIBE needs to be able to group these 2 separate courses into 1 course. This is done using the standard course. Each of these split courses are mapped to the same standard course. Since not all courses at a grant are reported as split courses, SCRIBE uses the credits field to determine if a course is a split course. A course with .5 credits is considered a split course. A course with 1 credit is considered a normal course (non-split). For courses with .5 credits (split courses), SCRIBE uses the grade in the marking period marked as final and it there is no grade in the marking period marked as final, it uses the most recent marking period grade. Normal courses always use the grade in the marking period marked as final just link the default student outcomes business rules. Courses are grouped by course id/number and standard course. In order for a course to be considered complete, the number of credits earned must add up to at least 1. Since we are grouping by course id/number and standard course, students can not get credit for taking the same split course 2x. For example using the Algebra I example above, a student can not get credit for taking Algebra I by taking the Algebra I A split course twice. They, would need to take both the Algebra I A and Algebra I B course. The attendance data is reported on in the same way as the default student outcomes business rules, only the attendance data in the marking period/term that is denoted as a final marking period is reported on. This release introduces new set of student outcome business rules called the credits per term student outcomes business rules. This set of business rules supports both the concept of normal courses and split courses without the need to distinguish between them. In the split course student outcome business rules, the number of credits the course was worth determined whether the course was a split course or not. In this business rule set, the credits field for a course will determine the number of credits the course is worth per marking period/term. So, a course set to .5 credits will be worth .5 credits per marking period/term. For example, a student taking a .5 credit course with passing grades in semester 1 and semester 2 will have earned 1 full credit for the course. A student with only a passing grade in semester 1 will have earned only .5 credits for the course. In order for a course to be included in a course completion or APR related report, the course must be associated to a standard course. This includes AP/IB/Remedial courses. The default and split course student outcome business rules do not require AP/IB/Remedial courses to be associated to a standard course in order to be counted in any counts of AP/IB/Remedial courses. The primary reason for this change in this business rule set, is that SCRIBE must have a way to determine when a course is considered complete. Standard courses in SCRIBE now have a new field called Credits to Complete. This new field defines the number of credits needed for a standard course to be considered complete. The Credits to Complete field will default to 1 in most cases. The allows SCRIBE to support 1 semester courses that are worth .5 credits per term. Grants using the credits per term student outcomes business rules will be set up using marking period types following a new format consisting of normal marking periods and a single final override marking period. For example, the semesters with final override marking period type will have the following marking periods – S1, S2, Summer, and Final. The Final marking period will be used as a final override grade for the given course. If a Final override grade is provided, all other marking periods are ignored. The Final override marking period can be used in cases where you have a final grade for a course but do not know what student’s grades were in the actual marking periods or you wish to calculate the final grade in a way that is different than what SCRIBE does. There is a new field associated to a course called Final Override Credits. This is the credits associated to a course, if the Final Override marking period is used. The Final Override Credits field for courses will default to 1 credit. When calculating whether a course is complete or course grade, the courses will be grouped by school year, standard course, and marking period. This will allow SCRIBE to support students taking a course at a school in semester 1 and then transferring to another school in semester 2. In this case, there would be 2 separate courses with the same standard course and credits per term would sum up to the number of credits required to complete as defined by the standard course. The school year is included in the grouping, in order to handle cases where students begin taking a course in one year and complete the course in a following year. In reports where a final grade is calculated, SCRIBE will use a weighted grade calculation – sum weighted term term grades/ total credits earned. In addition, the credits per term student outcomes business rules will only include passing grades in calculations to determine final grade or whether the course is complete. A non-passing grade will simply be worth 0 credits. Attendance data will be summed across all non-final marking periods for the school year. For example, S1 = 12 absences and S2 = 4 absences will be reported as 16 total absences for the school year. The Final override marking period will be used to override this calculated total. If there is a value in the Final override marking period, that value will be used to as the total absences for the school year and any data in the individual marking periods will be ignored. There are sets of reports for each of these student outcome business rules. A grant will only be set up to follow one of these sets of business rules and will have access only to the reports set up for the rule set they are following. Section VI – GEAR UP Student Outcomes (Credits Per Term) – This is a new version of the existing Section VI – GEAR UP Student Outcomes report that is setup to follow the new Credits per Term Student Outcome Business Rules. Section V – Data Regarding GEAR UP Activities – Program filter now properly filters the teachers in report. Previously, it was always reporting on all teachers even if a specific program was selected in the report filters. Student Course Type Completion Progress (Credits Per Term) – New report providing the number of credits completed by each student up to the selected school year for each course type. Calculations are based on the new Credits Per Term Student Outcome Business rules. Student Course Type Completion Progress (Split Course) – New report providing the number of credits completed by each student up to the selected school year for each course type. Calculations are based on the Split Course Student Outcome Business rules. Student Course Type Completion Progress – New report providing the number of credits completed by each student up to the selected school year for each course type. Calculations are based on the Default Student Outcome Business rules. Section VI – Courses Above Algebra 1 (Credits Per Term) – New version of existing report that follows the new Credits Per Term Student Outcome Business rules. Section VI – Successful Progress – English/Language Arts Courses (Credits Per Term) – New version of existing report that follows the new Credits Per Term Student Outcome Business rules. Section VI – Successful Progress – Mathematics Courses (Credits Per Term) – New version of existing report that follows the new Credits Per Term Student Outcome Business rules. Section VI – Unexcused Absences (Credits Per Term) – New version of existing report that follows the new Credits Per Term Student Outcome Business rules. Incomplete Attendance Data – Details – Removed Marking Period Group filter. Report now always reports on final marking period. Incomplete Attendance Data – Details (Credits Per Term) – New version of existing report that follows the new Credits Per Term Student Outcome Business rules. Incomplete Performance Data – Details – Report changed to check against the final marking period. Incomplete Performance Data – Details (Credits Per Term) – New version of existing report that follows the new Credits Per Term Student Outcome Business rules. 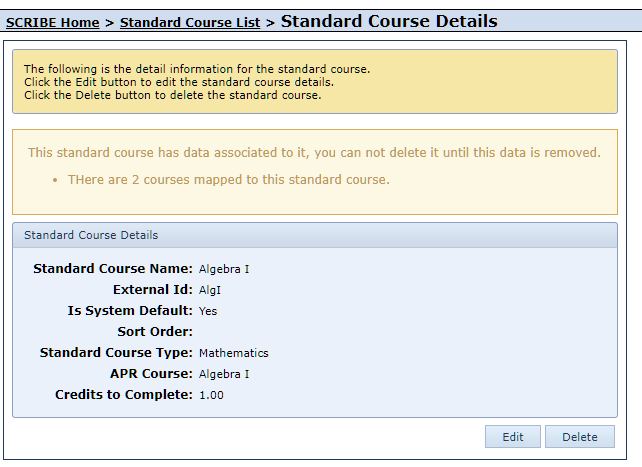 Incomplete Course Data – Details – Removed Marking Period Group filter. Report now always reports on final marking period. Incomplete Course Data – Details (Credits Per Term) – New version of existing report that follows the new Credits Per Term Student Outcome Business rules. Course By Grade Level Overview (Credits Per Term) – New version of existing report that follows the new Credits Per Term Student Outcome Business rules. Course By Grade Level Details (Credits Per Term) – New version of existing report that follows the new Credits Per Term Student Outcome Business rules. Student College Access Readiness – Removed Marking Period Group filter. Report now always reports on final marking period. Student College Access Readiness (Credits Per Term) – New version of existing report that follows the new Credits Per Term Student Outcome Business rules. Report – Courses | Course Completion – Renamed to Course Completion By Grade Level. Course Completion By Grade Level Completed (Credits Per Term) – New version of existing report that follows the new Credits Per Term Student Outcome Business rules. 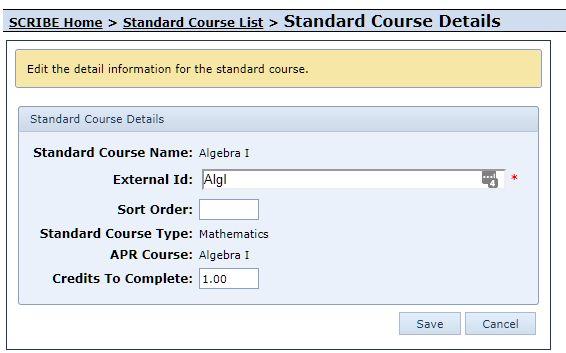 Incomplete Course Data – Summary – Removed Marking Period Group filter. Report now always reports on final marking period. Incomplete Course Data – Summary (Credits Per Term) – New version of existing report that follows the new Credits Per Term Student Outcome Business rules. Incomplete Performance Data – Summary – Removed Marking Period Group filter. Report now always reports on final marking period. Incomplete Performance Data – Summary (Credits Per Term) – New version of existing report that follows the new Credits Per Term Student Outcome Business rules. Incomplete Attendance Data – Summary – Removed Marking Period Group filter. Report now always reports on final marking period. Incomplete Attendance Data – Summary (Credits Per Term) – New version of existing report that follows the new Credits Per Term Student Outcome Business rules. Section VI – Course Completion (Credits Per Term) – New version of existing report that follows the new Credits Per Term Student Outcome Business rules. Course/Grades Lookups – the Standard Course list should only include Standard Courses mapped to the Instance and has been updated to include the following fields – Standard Course Id, Standard Course Name, External Id, APR Course, and Credits to Complete. Course/Grades Lookups – a new APR Course list has been added and includes the following columns – APR Course Name, APR Course Level, and APR Course Type. Course/Grades Lookups – report should only show marking period types currently mapped to the instance. Student Enrollment Export – added JoinedWorkForce and JoinedArmedForces fields. Service List Export – Added the Date Created and Date Last Updated fields. Course List Export – Added new Final Override Credits Column. 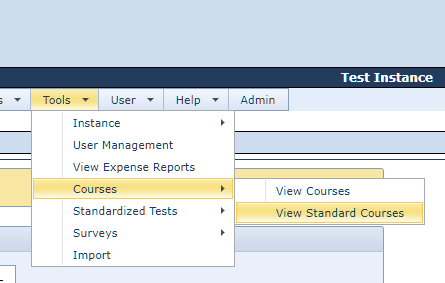 Course List Import – Standard Course mapping can now be setup to use either the SCRIBE internal Standard Course Id or the new Standard Course External Id which is customizable by Instance. 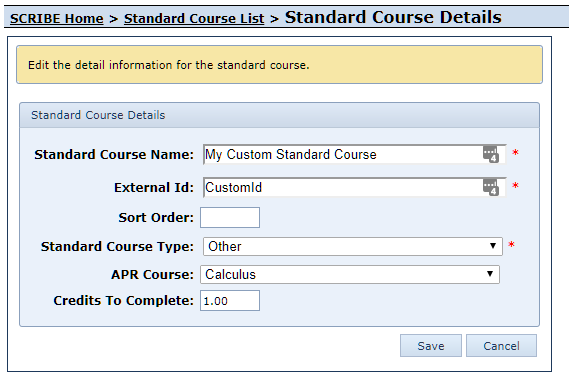 Course List Import – Added ability to import new Final Override Credits field. Standardized Test Import – Date taken can no longer be a date in the future. This validation will automatically be done in the pre-processing import step. The validation can be done immediately in the validation step, if with a modification to the import configuration. If you are not seeing these validation issues in the initial validation step and want to, contact support. Attendance Import – Fixed a minor issue that caused some Attendance imports configurations to crash. Service and Service Participation Imports – Now restricts the External Id validation to the selected school year. This allow the same External Id for a service used in a previous school year to be used in another school year. Service Participation Import – now handles issue where participant is not found properly. Student Group Import – Added new Student Group Import. Contact SCRIBE support to set up. Various improvements to import configuration settings. Various Import Validation and Pre-Processing report modifications to improve clarity. Fixed defect where users with access to multiple instances would occasionally experience SCRIBE errors when accessing pages implementing Quicklinks. Fixed defect in how standardized tests taken were counted in Section VI – GEAR UP Student Outcome reports. Other various defect fixes and performance improvements.